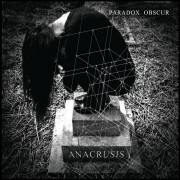 Peripheral Minimal is proud to announce the forthcoming, Paradox Obscur album. ‘Anacrusis’ – now available for pre-order. This is their second album and their first on a full-length LP. ‘Anacrusis’ is a massive dark monument full of analog tendencies to conquer the dancefloor… an album of complex Coldwave and Minimal Synth. Rapidly becoming a cult act, this album will surely become a classic of it’s genre, and will hopefully please new and current fans of the band. Another milestone for Rhodes’ finest.